Aroma Magic Revitalising Serum Remove bacterial infections & Opens Pores of Skin, Revitalise Skin, Restore youthfulness of skin. Helps to remove bacterial infections and opens the pores of the skin to make it dirt free. 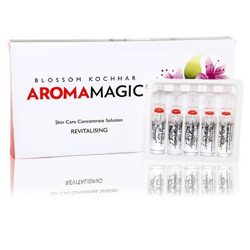 Aroma Magic Revitalising Serum Skin Care Concentrate Solution liquid based serum is an effective concentrate for dry, shallow and tired skin. Aroma Magic Revitalizing Skin Serum restores the youthfulness of skin by its lifting and firming action. It helps rejuvenate skin cells, maintain moisture balance, tones your skin. It remove fine lines and wrinkles and keep your skin young and glowing. Apply Aroma Magic Revitalizing Skin Serum once a day morning or night. In the morning apply on to clean face, when dry, apply Aroma Magic Almond Moisturizing Lotion. At night after applying concentrate, apply a few drops of Aroma Magic Beautiful Skin Oil. Press the ampule top narrowing with your thumb.